One beat of a butterfly's wings is all it takes. One beat that will change lives. One beat that will end lives. Hannah [AUSTRALIA] homeless and on the run. Gwen and Tehpoe [LIBERIA] kidnapped by violent rebels. Todd and Isabella [BRAZIL] threatened by piranha attack. Wai Yan [Myanmar] hunted by a cruel dictator. Stian Olberg [CRUISE SHIP CAPTAIN: SYDNEY] fighting to save his vessel from imminent destruction. For them, and many others, things will never be the same again. I really enjoyed Mortal Chaos when I read it a couple of years ago but for some reason I never quite got around to reading the sequels. Deep Oblivion popped back up on my radar a few weeks ago and I immediately ordered a copy and as it turns out I ended up enjoying it even more than the previous book. Although there are three books in this series the titles are linked more by the style in which they are written than anything else, there is no cross over of characters so it would be very easy to read the books in any order. The premise behind these books is the Butterfly Effect, the books are all incredibly pacey reads written in short 1-2 page chapters and have a large cast of characters. You might think that would make things confusing for readers but I find it incredibly easy to keep track of who everyone is and what is going on with them. The hardest thing about these books is making yourself put them down once you've started reading them! Have you ever wondered how a butterfly trapped in a high rise building in Australia could effect a backpacker in Brazil, a missionary worker in Liberia, a monk in Myanmar and a cruise ship? In Deep Oblivion Matt Dickinson manages to make connections between very different people who are all over the world, sometimes it is easy to see how their lives entwine but other times the connections are much more subtle and take a while to be fully revealed. I love the way the author constantly manages to surprise you, he'll build things up so you are expecting one outcome and then at the last minute throw something at you completely out of the blue. It's obvious from the tag line "Some will live. Many will die. All are connected." that not all of the characters are going to make it to the end of the book but I guarantee that you won't guess what happens to most of them! 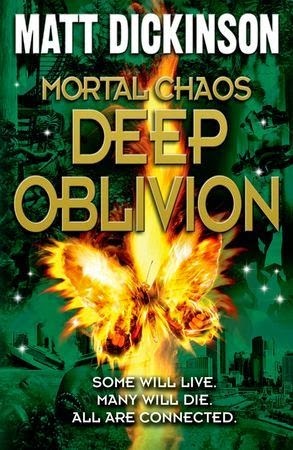 Deep Oblivion is a fast paced, action packed story that I devoured in one sitting, the story is intense, edge of your seat reading and I can't recommend it highly enough. Just added the first book of the series to my list, thanks !